3. and, is full of sight words that help young children identify the words that go with specific objects. If you are already familiar with SAY & PRAY BIBLE, this new partner book features the same fun style of artwork and educational elements. I love the small size and sturdy pages, perfect for little hands to hold. 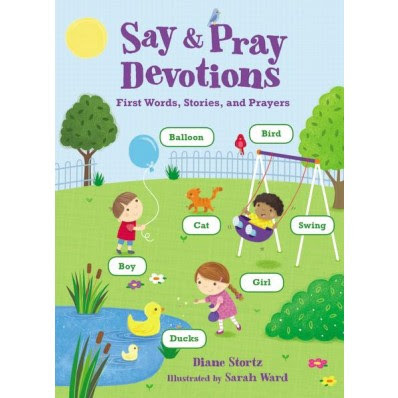 And, I especially love the included Bible verses and simple prayers that can help young children grow in their faith. If my kids were still young enough for this book, it would be at the top of my list to read together with them. Enter below for a chance to win a copy of this book to share with your children or grandchildren. Entries will be accepted until Saturday, October 29, 2016, at 8:00 p.m. CST. One entry per mailing address. Age 18 or older. Disclosure (in accordance with the FTC’s 16 CFR, Part 255: “Guides Concerning the Use of Endorsements and Testimonials in Advertising”): Many thanks to Propeller Consulting, LLC for providing this prize for the giveaway. Choice of winners and opinions are 100% my own and NOT influenced by monetary compensation. I did receive a sample of the product in exchange for this review and post. Only one entrant per mailing address, per giveaway. If you have won a prize from our sponsor Propeller /FlyBy Promotions in the last 30 days, you are not eligible to win. Or if you have won the same prize on another blog, you are not eligible to win it again. Winner is subject to eligibility verification. Thank you for offering to give away say and pray devotional, my son is almost 3 and he loves to lead prayer during our family prayer time. It's awesome to see Jesus use children in such a way. I know he would love doing these devotional with me. Thank you! Thank you for taking part int the giveaway! Best of luck to you! Are You Being Honest with God?